This is our One Minute Monday blog, the shot to our usually pint-sized posts on employment and skills. Lack of relevant experience is often cited by employers as an obstacle to employing young people and work experience is the attribute most valued by employers. However evidence shows us that fewer young people are undertaking part time work while they study. Since 1997 the number of 16 and 17 year olds combining part time work with full time study has fallen dramatically: from 42% to just 18%. The figure for 18-24 year old has also fallen to 33% from its 42% peak in 2006. This is especially concerning when one notes the overall growth in part time employment in the economy as a whole. The majority of those young people choosing not to combine learning and earning identify a desire to focus on their studies as their main motivation, although other factors play a role. 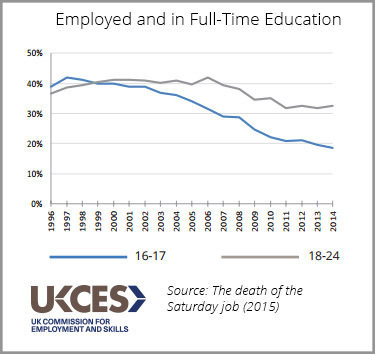 To find out more about the fall in young people earning and learning, such as whether this phenomena is unique to the UK, read our full ‘Death of the Saturday Job’ report.